It’s the gayest mashup party of the year, as Bootie presents a special Pride weekend party -- it’s Madonna vs. Lady Gaga Mashup Night! Your favorite dueling divas, mashed up with anyone and everyone! Only $5 before 10 PM! 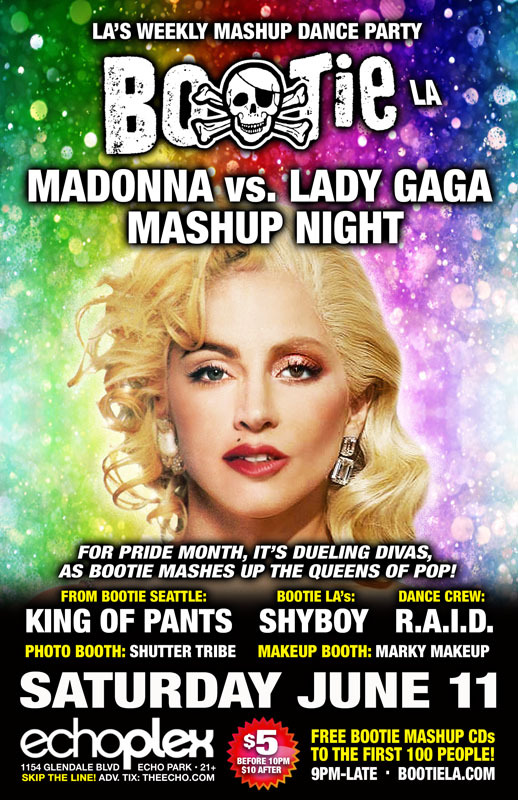 Bootie celebrates Pride weekend with a tribute to the first ladies of pop — it’s Madonna vs. Lady Gaga Mashup Night, as resident DJ ShyBoy and Bootie Seattle’s DJ Freddy, King of Pants mix and mash the dueling divas throughout the night! Plus resident dance crew R.A.I.D. gives you rainbow-a-go-go dancing insanity, Marky Makeup gives you a Prideful touch, and Shutter Tribe captures it all! Plus FREE Bootie mashup CDs to the first 100 people through the door!